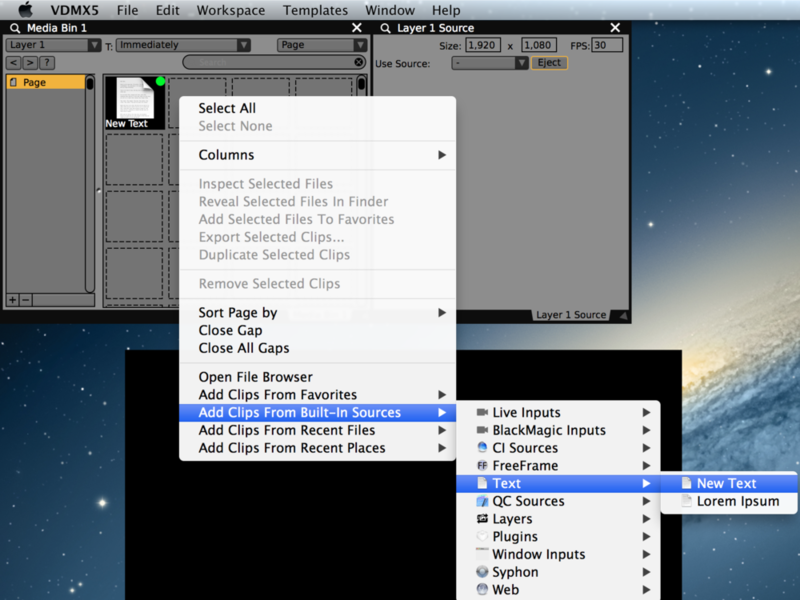 Download the completed project file and example Quartz Composer composition for this tutorial. Text layers are similar to other video generators in VDMX, with a few additional UI items for working with strings of words and letters. Below these special settings appear any additional parameters specific to the Quartz Composer composition being used to render the text as video. Text files can be loaded from a disk or created from the 'built in sources' contextual menu. Player controls for the text input allow for stepping through the file by character, word, sentence or line returns. Before creating your own text styles in Quartz Composer it is recommended that you read the tutorial on creating Quartz Composer based FX for VDMX. "Text Source Composition" pop-up menu chooses which patch should be used to render the text for output. These Quartz Composer patches can be found in the qcTextSources folder in the Assets directory. The special text generator protocol compositions for VDMX are designed to take a 'string' input and display it on screen. When a text file is played in VDMX5 the individual characters, words, and sentences are passed off to Quartz Composer patches to create a visual interpretation of the text. These special text patches must have an input splitter of type "String" with the published key "FileInput". Once added to the VDMX assets the text player composition will be accessible from the 'Text Source Composition' menu in the layers controls when text files are playing back. Adding an Input Splitter with the title 'FileInput' to create a qcTextSource patch. String inputs that end with the suffix "_FontMenu" will appear as a pop-up menu for font selection when loaded in VDMX. 'Example Text' composition used to render a text file in VDMX with font menu and player controls for strings.